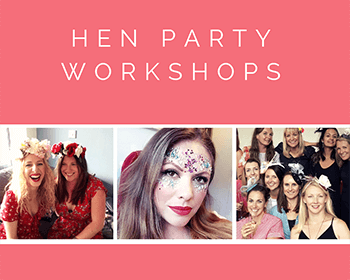 Looking for a fabulous crafty hen do in Brighton? We can help you! Choose The Glam Hatter Girls for your crafty hen do in Brighton. We offer Fresh or Fabric Flower Crown Making, Fascinator Making, Cocktail Ring Making and many more hen party workshops. The Glam Hatters also provide Glitter Stations and Flower Stations. 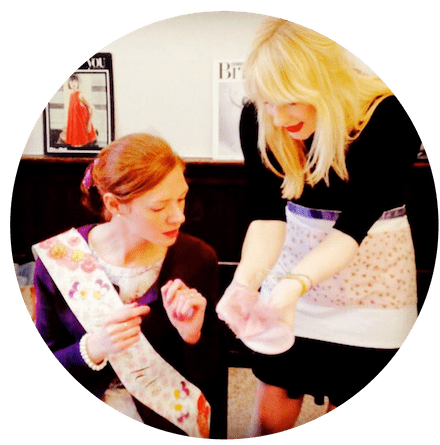 Click the button below to view our full list of crafty hen party workshops in Brighton and the surrounding areas. 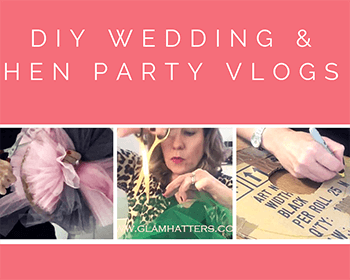 The Glam Hatter Girls have organised hundreds of crafty hen parties across the UK. We are a team of creative experts and we love what we do! With step-by-step instructions, lots of fun and loads of giggles our teachers will ensure you have a lot of fun. 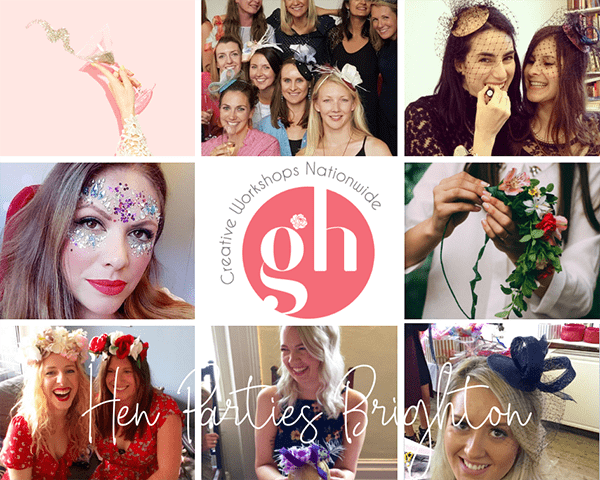 Book a crafty hen do in Brighton with The Glam Hatter Girls and we will make sure you and your friends make something beautiful and have a lovely time with us. We work with tea houses, bars and restaurants in Brighton and the surrounding areas. 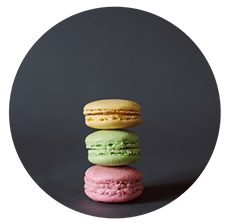 The Glam Hatter Girls can arrange your crafty workshop with afternoon tea, lunch or a cocktail masterclass at their venues. A three hour time slot with our recommended venues works really well for our workshops. Your hen party group arrives at the appointed time and has lunch or afternoon tea while The Glam Hatter Girls set out the materials for your crafty hen do. Then when you have finished your afternoon tea the Glam Hatter Girls teach your one and a half hour workshop. You then wear your fabric flower crown, fresh flower crown or fascinator out on the town for your hen party in Brighton! 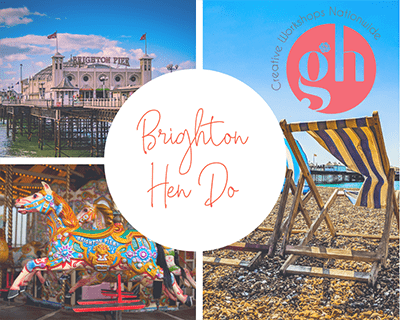 When you book your crafty hen do in Brighton with The Glam Hatters the ideal itinerary would be lunch/afternoon tea at 1pm. Followed by a Glam Hatters Crafty Workshop at 2pm. This would end at 3.30pm giving you time to pop back to your hotel or hen house to get ready for the evening festivities. Aim to have your girl gang back out by 6pm in time for pre-dinner cocktails. Followed this with a fabulous dinner and then dancing till dawn. Remember the Glam Hatter Girls rule for a good night out – hard drink follows soft drink! Try and have a glass of water for every alcoholic drink you have. That way you can enjoy the following day out in Brighton exploring the lanes and buying super cute things! We can also recommend lots of cool bars, comedy night and fun things to do in Brighton. Please contact us on the form below and we will help you organise your crafty hen do in Brighton. 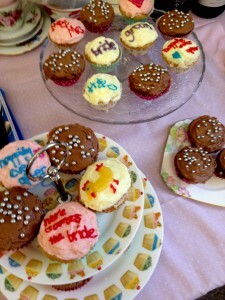 The Glam Hatter Girls also offer crafty hen party activities nationwide. 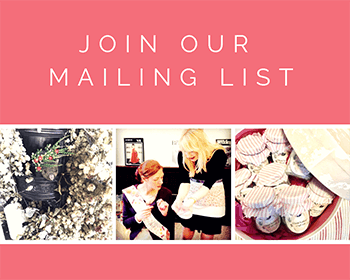 Get in touch with Janie on the form below – tell her where you are and she will arrange the rest! Our Glam Hatter Florists will teach you step-by-step to make a gorgeous Floral Crown. Using fresh, seasonal Flowers in a rainbow of colours. Just the thing to wear to the hen party that evening. Our Glam Hatter Florists are super fun as well as highly qualified. 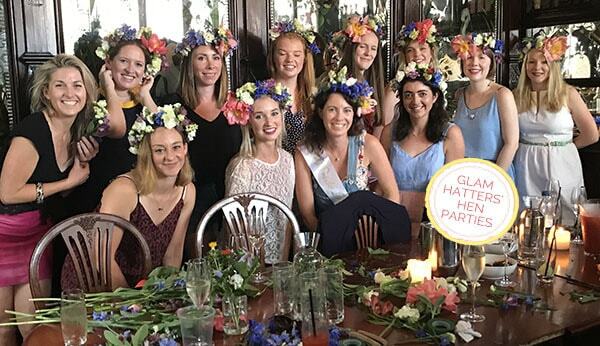 A Floral Crown Workshop with Glam Hatters is the perfect hen party activity. Book a workshop with us and you will learn to make a gorgeous flower crown to take away with you. The workshop is 1.5 hours long, just the right amount of time to learn a lovely new skill while catching up with your bride tribe and having lots of giggles! 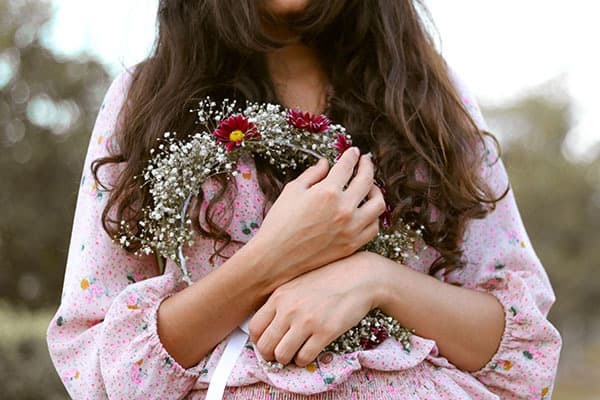 The minimum group size for the fresh floral crown workshop is 10 hens. We have no maximum number of hens as we have lots of lovely florists and large venues! For smaller groups please email for a quote and we’ll be delighted to help. We have no maximum number of hens as we have lots of lovely teachers and large venues! We have Glam Hatter Florists nation wide bringing the Glam Hatters’ hen parties to a location of your choice. We can help you find a venue and help to organise your afternoon tea! Please email with details of group numbers and locations you would like or an address of a venue you already have booked and we will give you all the details. We have a London Venue Too! We have a gorgeous venue in London and we do not charge for venue hire. You are very welcome to bring your own champagne to our venue in Exmouth Market, London and we will provide the bubbly flutes and fridges to keep it cool! 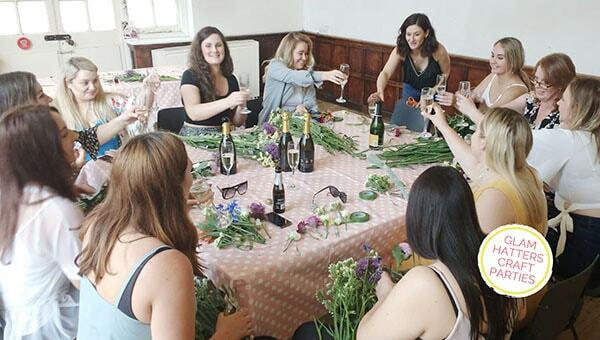 We’ve found bubbly to be the perfect tipple during a floral crown workshop! We also work with London venues in lots of areas and can help you book a venue. Janie will chat with the venue for afternoon tea/lunch menus and take the leg work out of organising a hen party! Check out our venues here. Prices vary according to the size and location of the floral crown workshop.Please contact Janie on the form below with details of your hen party and she will be delighted to give you a quote and help you sort out your hen party with lots of information and tips. If you would prefer to use fabric flowers in order to keep your flower crown for the wedding hop over to our fabric flower crown workshop! 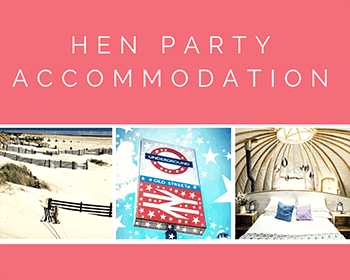 *Book for 14 hens and the bride goes free! Craft a vintage inspired fascinator using fascinator bases, fabulous trimmings, fabric Flowers, beautiful beads, pearls, veiling and tulle. 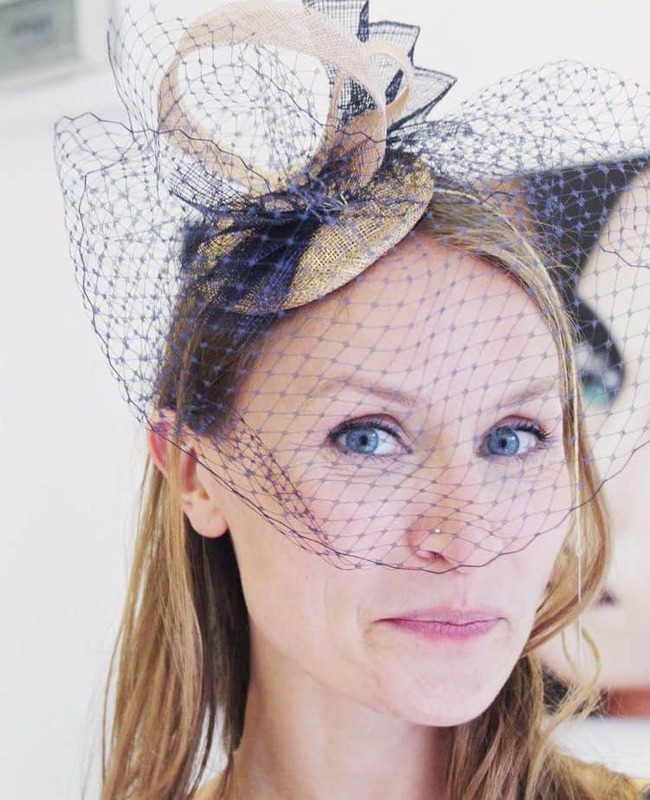 The Glam Hatter Girls will show you step-by-step how to make sinamay roses, sculptural creations & use gorgeous beading to create a stylish hat. Wear it on your hen party or save it for the wedding. This workshop is suitable for absolute beginners – even if you’ve never picked up a needle in your life! We have gorgeous venues in London and we do not charge for venue hire. Check out our venues here. We travel nation wide bringing the Glam Hatters’ to a location of your choice.We do not charge for travel. Please email us with details of hen numbers and locations you would like or an address of a venue you already have booked and we will give you all the details. If you have any budget requirements, please DO ASK. We will always, always do our best to help you. 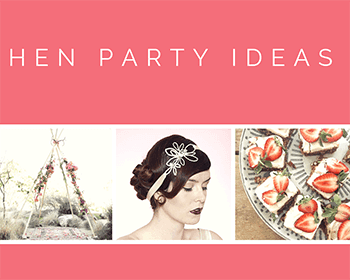 Fabulously Affordable Hen Party Ideas. Your first task is to work out a programme for the day. 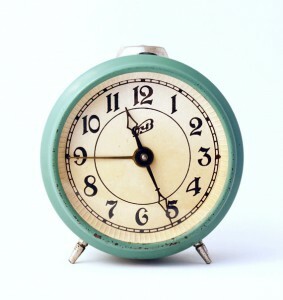 It’s good to start the party at around 1 o’clock, ensuring that no one “peaks too early”! A workshop is an ideal starting point as it’s great girl bonding exercise. I’ve observed hen parties for the last 6 years and noticed there is often one or two hens who don’t know the rest of the group. They may be a friend of the groom or a younger cousin and haven’t met the other friends before. During our Glam Hatter workshops hens are encouraged to check in with the others in the group on how a colour, shape or style suits them. It’s a great ice breaker, gets everyone chatting and includes the older generation. Talking of the older generation, my advice to the younger hens is to bag a seat next to one of the Mums/Aunties – they did sewing at school!!! Mums and Aunts are always best at sewing! 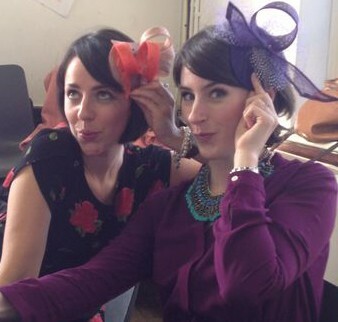 Choose a workshop that everyone can enjoy, our Glam Hatters’ Bronze Package Vintage Fascinator Making Hen Party Workshop at £38 per person is super affordable, lasts for one and a half hours and at the end of it you will come away with a fascinator to wear to the wedding! 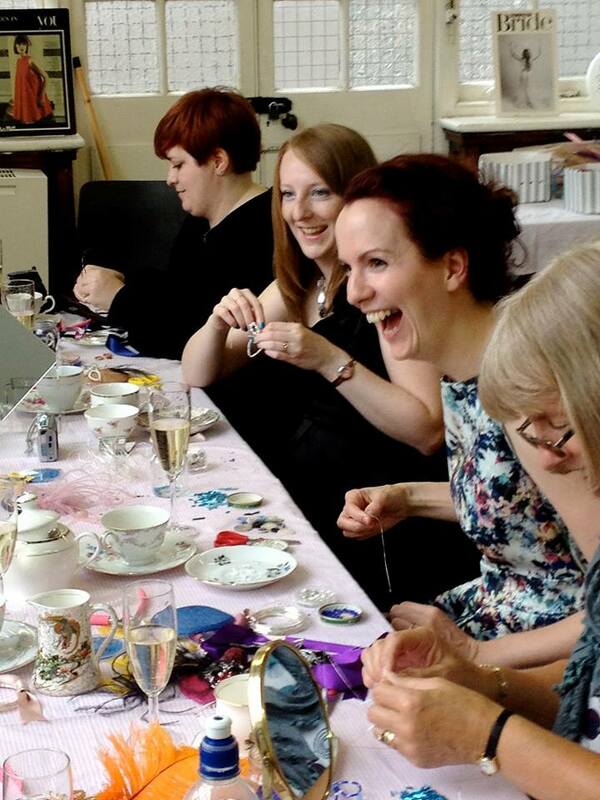 Fun, chatting, hat making and bubbles at Glam Hatters. This is superb added value and means you won’t be trailing around the shops trying to find headwear to match your outfit 2 minutes before the wedding! We have masses of colours to choose from, either match your fascinator to your dress or match it to your bag and shoes. It’s a wonderful way to bring an outfit together and give it va-va-voom appeal and you’ll also look a million dollars without spending out on expensive accessories. I think there is nothing so well put together as an outfit with matching shoes and hat. 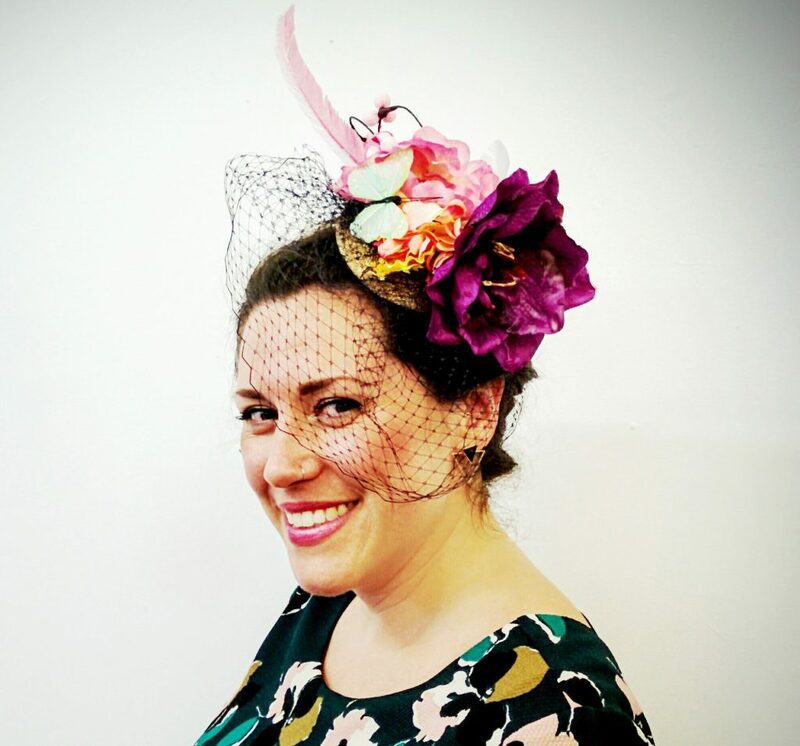 Glam Hatters provide everything you need, millinery bases, beading, netting and tulle, ensuring you will make a fabulous fascinator with a gorgeous vintage look. Our Glam Hatter Girls are experts in their field and we are unrivalled in our quest to help you achieve a beautiful headpiece, but rest assured the workshop is suitable for a levels of experience and we will make this happen whilst having a lot of fun, a lot of chatting and a lot of bubbles along the way. 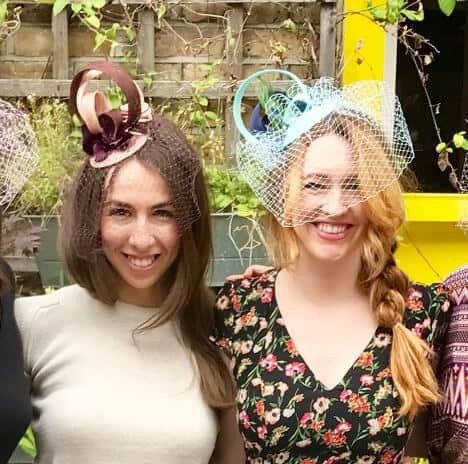 At £38 a head it’s one of the most competitively priced fascinator making hen party workshops in the U.K.
Another way to stretch the hen party finances is to combine the workshop with vintage afternoon tea. This cuts out having lunch in a restaurant keeps more money in the kitty. At Glam Hatters we have 2 afternoon tea choices…. The Glam Hatters’ Afternoon Tea option is £11.50 per head and we will serve you tea, finger sandwiches and a selection of cakes all on beautiful vintage china. Or for £5.50 per head you can enjoy a mini afternoon tea consisting of tea and 2 cup cakes per person. 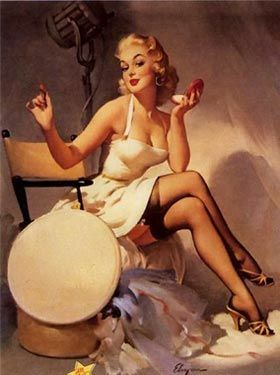 Or, to stretch the kitty even further you can bring your own nibbles and bubbles and we will provide the vintage china to plate them prettily for you (*For hen parties in our London venue). The cakes pictured here were made by a hen at a recent party and gave a lovely home made look to the afternoon tea, they also tasted delish! 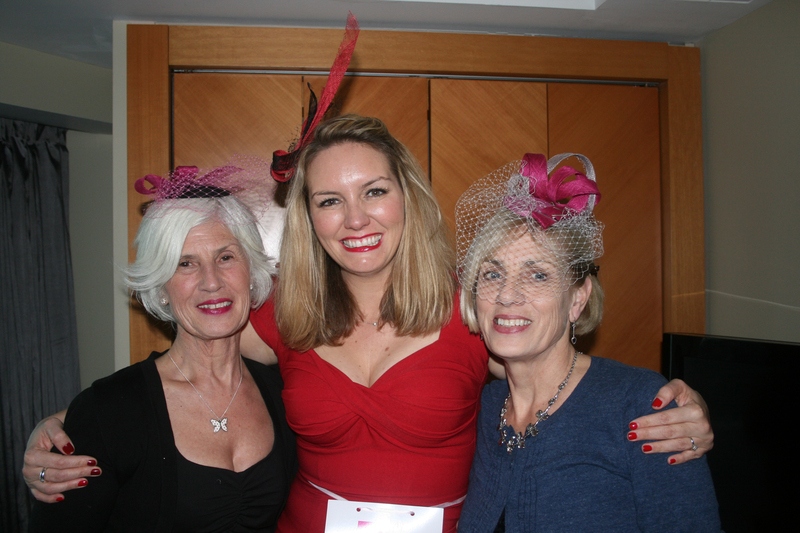 Once you’ve completed your Glam Hatters hen party workshop head off for dinner and dancing. If you’re coming to our venue in Exmouth Market EC1 you are close enough to walk to either Angel tube or Farringdon tube to head straight into the heart of London. 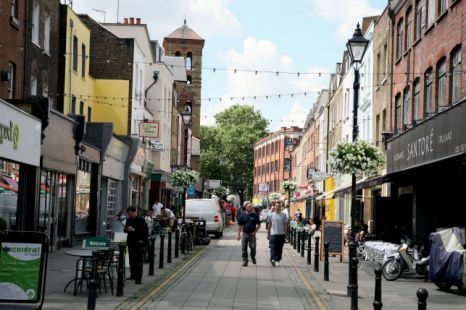 Or you could meander through Exmouth Market taking in the individual boutiques, cafes and restaurants. Take a look at this link for details of restaurants in Exmouth Market. A particular favourite of mine is The Exmouth Arms. They do amazing sliders and the atmosphere is very cool and very relaxed. From here head over to Upper Street which is full of happening places and only a short walk or taxi ride from Exmouth Market. Here is a link for things to do in Upper Street. 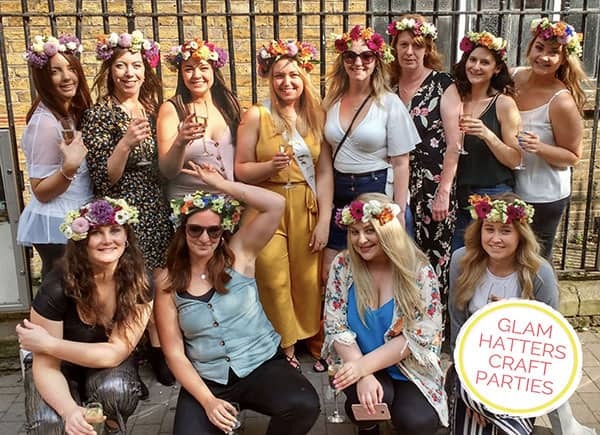 Choose Glam Hatters for your hen party workshop and your hens will have will have soo much fun as well as coming away with a fascinator that they will be proud to wear. If you have any budget requirements, please DO ASK. We will always, always do our best to help you. The Glam Hatter Girls travel nation wide bring hat boxes full of fabulous materials for your fascinator making hen parties. The Glam Hatter Girls travel nation wide bringing the Glam Hatters’ hen parties to a location of your choice. Email me with details of your hen party numbers, the city/town/village that you would like to hold your hen party in and any questions or requests that you have to make your hen party that little bit more fabulous and more personal to your party. 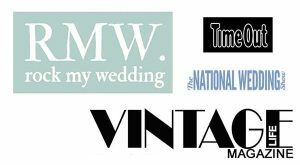 I’m looking forward to helping you to organise your hen party and seeing you make your gorgeous vintage fascinators very soon! For more hen party packages click here.